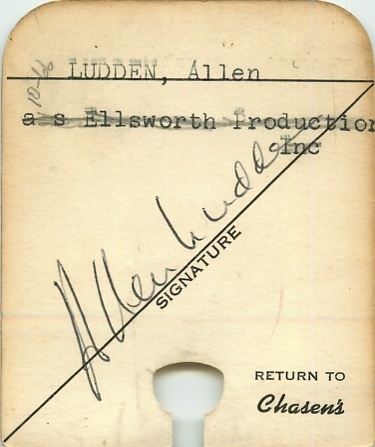 Here’s Allen’s card from the rolodex at Chasen’s Restaurant in West Hollywood. If the staff needed to verify that a diner had a charge account at the restaurant, this is what they checked. The account was opened in May 1962. Allen took Betty to dinner and a performance of “Critic’s Choice,” the play they were to co-star in during the summer of 1962. Did Allen open the account specifically for the very first date/”business meeting”? 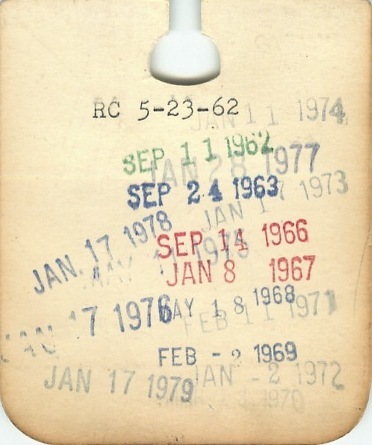 On the reverse of the the card, you’ll also note that Allen charged a meal on September 23rd of 1962; likely this was one of his many courting trips to the West Coast prior to their April 1963 engagement. Betty’s 51st, 54th, 56th and 57th birthdays appear to have been celebrated at Chasen’s; as there are stamps for January 17th in those years.